001) For someone that is currently meant to be cutting down on sweet, sugary snacks, I sure seem to have eaten a lot this week. All those Easter treats were just too much temptation for a sweet tooth like me. 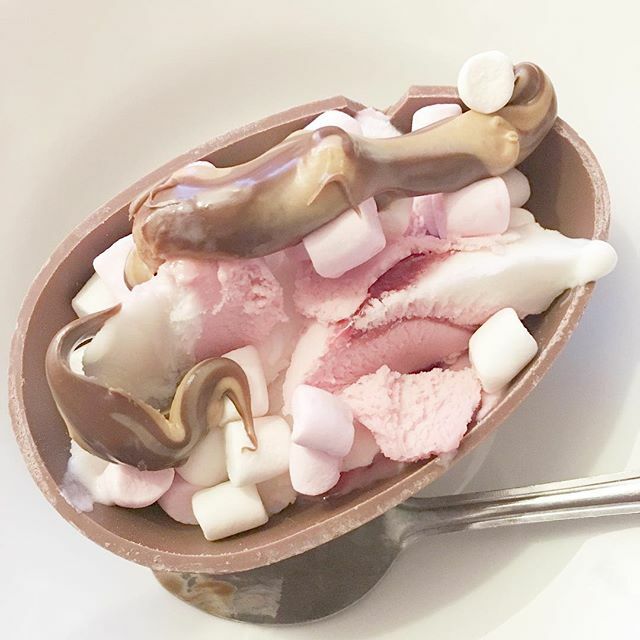 On Sunday, I had an epic pudding with half an Easter egg, fro-yo, mini marshmallows and some salted caramel spread. Yummy! 002) This week, I have had a brilliant week fitness-wise. I have managed to have a PB in Body Pump with my shoulder track weight and managed to maintain it throughout the week. I've also managed to have a few cheeky weight increases in other tracks too. Right now, I am definitely in my best form in Body Pump. In other fitness news, I had a fabulous dumbbell based abs class on Friday evening. I'm generally not one for dumbbells and much prefer weight plates but the instructor had designed a circuit that really tested us. Absolutely loved it! 003) Scrolling through Zanna Van Dijk Insta (girl crush right there! ), I came across a Quark bowl that she had had previously. It was something different for breakfast, so I decided to give it a go. Well hello! Although the Quark was a little sour (some Maple Syrup fixed that issue), it was absolutely delicious with all the fresh fruit and seeds I had with it. Definitely one to add into my breakfast options. 004) Soap & Glory are well-known for their fabulous products and as part of a Christmas gift, I was given the hand food set. I have been using the Sugar Crush version recently and honestly, it smells so good that I could eat it. So, so good. 005) It is very rare that I will watch a program not on catch-up as I spend all day at work and the evening in the gym. Today, I have just finished watching 'The Night Manager' on BBC iplayer and it was incredible. Such a well-produced book adaptation. Tom Hiddleston & Hugh Laurie were outstanding too.